It is said there are three major cuisines in the world: Turkish, Italian, and French. Each is based on local ingredients and flavors. While many well-known national cuisine's rely on one basic element (i.e. French cuisine is based on sauce and pasta forms the essence of Italian cuisine), there is no single dominant feature in the Turkish kitchen. Home of the original Mediterranean diet, Turkish cuisine is well on its way to becoming the next big trend in cooking as more and more attention is being paid to it. Turkey has made enduring contributions to the world’s cuisine, especially its gift of yogurt, with its diverse gastronomic history and flavorful, healthful recipes. This major cuisine is a colorful mosaic based on and enriched by the recipes and techniques of many ancient cultures (from the Hittites, Byzantines to the Chinese, Crusaders, Persians, and others); centuries of palace cooking, creativity of housewives, and geography of the regions. From all the peoples the Turks came into contact with they added to their culinary pool, enriching their own cultural characteristics and cooking techniques. Some of the earliest fusion cooking began with the Ottomans to create one of the world’s greatest cuisines. Today many of the recipes from this period are still a part of Turkish cuisine. Elements of Persian cuisine, including the combining of meats and fruits/vegetables in their stews, came with the establishment of the Seljuk state. After settling in Anatolia, and with their adoption of Islam, Arab cuisine contributed many spices, including hot peppers, and dishes based on wheat and mutton. Seafood dishes were added as they reached the Aegean and Mediterranean seas. In the 16th and 17th centuries, the Ottomans traded with the Spaniards who introduced many new products from the New World to Istanbul, including: chili peppers, tomatoes, and maize. These products were quickly absorbed into the Palace cuisine and thus out into the Empire, shaping “much of what we today call the Mediterranean diet." Today there are seven regions in Turkey, each with indigenous agricultural products, cultures, customs, traditions, and local dishes. They are: Black Sea, Aegean, Marmara, Mediterranean, and the 3 regions of Anatolia. In addition, the variety of climates in Turkey allows the cultivation of a wide diversity of crops. 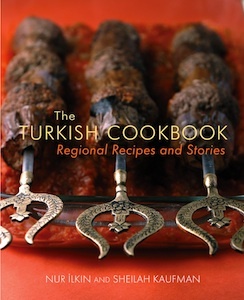 Cosmopolitan, rustic, delicate, hearty, healthful, traditional, complex, and evolving best describe Turkish cuisine. Place yeast and sugar in a large bowl and add water. Mix well to dissolve yeast and sugar and let stand for about 10 minutes to "proof," or until foam forms on the top. If you do not get foam your yeast may be dead and the recipe will not work. Whisk in the oil, salt, and 2 cups of flour and mix until blended and smooth. Add another cup of flour, blending well, then another cup, blending well until mixture is smooth. Using your hands, mix in the last 1 1/ 2 cups of flour. Dough may be somewhat sticky - if it is, add extra flour by the tablespoon as you knead the dough. On a lightly floured work surface, knead the dough until you have a ball of dough that is smooth and elastic, about 8 to 10 minutes. Lightly grease a large bowl and place the ball of dough in the greased bowl, turning the ball so all sides are lightly greased. Cover bowl with a clean kitchen towel and let dough rise for an hour in a warm, draft-free place. Dough will double in bulk (about an hour). Punch down the dough and using floured hands, divide dough into 16 to 18 balls. Place a ball on the lightly floured surface, pat ball down, then pat back and forth between the palms of your hands a few times, stretching the dough. Take your thumb and index finger and go around the outside of the flattened dough stretching from the center out until dough is a circle about 5 inches across. Dough should be about 1/ 4-inch thick. Continue until all balls of dough are stretched. Lightly spray a large non-stick skillet and fry as many "pitas" as fit (without touching each other) in the skillet. Cook over medium heat until puffed and lightly golden brown on the bottom. Turn over and cook until top is just lightly golden. Remove from pan and continue until all pitas are cooked. Serve warm with jam, olives, yogurt, or your favorite dip. Dry roast the nuts: Heat a skillet over medium heat, add walnuts, and dry roast for 6 to 7 minutes, shaking the pan so the nuts do not burn. Remove from heat and let cool. Place the walnuts in a food processor and process to breadcrumb consistency. Add breadcrumbs and process or pulse a few times. Add the red bell peppers, garlic, salt to taste, pomegranate syrup, brown sugar, and olive oil. Blend well until a rough (not smooth) paste is formed. Transfer paste to a bowl, cover, and refrigerate until serving. Turkey is a land with a history that stretches back over 10,000 years and is best described as a mosaic. The only city in the world located on two continents is Istanbul, which has been the capital of three great empires, Roman, Byzantine and Ottoman for more than 2000 years. Turkey straddles both Europe and Asia, but most of it lies in Asia in an area once known as Anatolia or Asia Minor. Its boundaries include three major bodies of water: The Black Sea to the North, the Aegean Sea to the West, and the Mediterranean Sea to the South. Anatolia is bordered by the European section of Turkey, by the Sea of Marmara, and the Bosporus and the Dardanelles Straits. The Bosporus links the Sea of Marmara to the Black Sea while the Dardanelles links the Sea of Marmara to the Aegean Sea. Turkey’s landmass shares borders with eight countries. The Turks introduced coffee to Europe, and The Turks also gave the Dutch their famous tulips. Turkey provides 70% of the world's hazelnuts; the nut in your chocolate bar was most probably grown in Turkey. Part of Turkey's southwestern shore was a wedding gift from Mark Anthony to Cleopatra. Santa Claus was originally from Turkey. Sheilah Kaufman's website is www.cookingwithsheilah.com. Earn a chance to win a free cookbook every week: Get Sally's eNewsletter!